Upload a picture to the media section showing new UI stuff. I have started doing my work from Nextspace, a cool coworking space in downtown Santa Cruz. Here is a nice video. 28-11-2013: GSO & Offleash mentioned in german c't magazine article. Grand Space Opera is a single player space-battle action RPG by independent game developer Offleash Games. It is about controlling a massive, lumbering spaceship in battle. It is also about crafting your own story in a Grand Space Opera: make a fortune as trader, join the military and safe the day - or claim an empire and rule the galaxy with iron fist. Encounters of up to 20 capital ships - plus numerous smaller vessels. 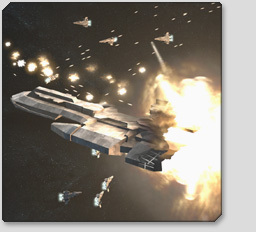 Control your flagship and give order to your squadrons and fighter wings. 3D-isometric perspective. 2D navigation. Believable visual style. Newtonian physics - lateral drift is partly compensated by automatic thrusters. Beware: heavy ships have a lot of inertia. Also: collision damage. Line-of-sight shooting - friendly fire included. Real-time combat. For now: single player only. The goal here was to create action-packed, fun combat that looks somewhat realistic and conveys a feeling for the scale of ships. The universe of Grand Space Opera is governed by sandbox mechanics that range from trade to grand scale warfare. You may start a navy career, or become a trader, mercenary, pirate, mercenary, explorer or a slaver (it's not a very friendly universe). Beyond that you can advance to be a governor, admiral, or even run for presidency or claim an empire. Most likely, there will also be spies, ambassadors and high-level admirals, who command faction forces across multiple star systems. All these positions are basically small subgames that lock into the ruleset of the gameworld. It could be viewed as an RPG that is embedded in a 4X strategy game. There will be story, there will be purpose, but the story-line is yours to make. 50 starsystems: fully colonized core systems, wild frontier worlds and forgotten wastes whose secrets wait to be uncovered. A dynamic game world. Economy, warfare and politics are all deeply intertwined. World design is part procedurally, part hand-crafted. Fully moddable. A shallow learning curve and about six hours of gameplay with high replayability. GSO is also intended as a testbed for new ways to blend sandbox mechanics and narrative control. The game is still under development. You can expect an early access/alpha sale phase from december 2014. Release is planned for late 2015. See also the FAQ section for further info.